One of my favorite things about the holiday season is the food. There are few things that say Christmas to me like homemade fudge. My husband isn’t much for chocolate so I knew if I wanted to make something the whole family could enjoy I needed to create a peanut butter fudge recipe. In an effort to maximize my time and efforts in the kitchen, I like to create recipes that are simple and easy but taste like they took much more effort. To accomplish this finding a way to create a no bake fudge recipe was a priority. Surprisingly I managed to an easy peanut butter fudge recipe on the first attempt. I’m not typically a midnight snacker but I just couldn’t resist sneaking a piece one night. It was so good and didn’t last very long at all, in fact I’m sure my doctor is going to be surprised at the sudden increase in my weight from last month. I’m a sucker for homemade goodies. Put powdered sugar in mixing bowl and set aside. Place saucepan over medium heat and melt butter completely. Then, stir in brown sugar and milk. Bring to a boil, then time for 2 additional minutes stirring constantly. Remove pan from heat and mix in peanut butter and vanilla extract. Add peanut butter mix to powdered sugar and beat with electric mixer until smooth. Line a baking pan/dish with wax paper and pour mixture into dish. Place in the fridge and cool completely until set. What’s your favorite holiday dessert recipe? « Are Home Gender Predictor Tests Accurate? You could also use peanut butter chips in place of the chocolate chips. Sounds absolutely delicious! Thanks for sharing the recipe. That’s a really good idea! I was hoping for a little more chocolate flavor in it but it turned out so well that I can’t complain. Seven pounds in a month gained – that good. It’s so good! Even my mom who’s not a huge fan of peanut butter loved it. Melts in your mouth! 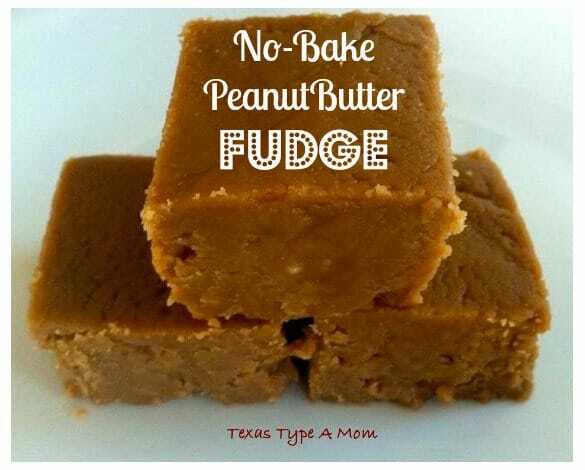 My hubby loves peanut butter fudge, looks delish! It really is delicious. I was going for a peanut butter and chocolate mix and it didn’t turn out like I was anticipating but tastes so good! Oh my goodness that sounds looks so good! Thanks for sharing! Peanut Butter Fudge is the best! Thanks for sharing how you make yours. Gotta try it! Wow, this looks and sounds delicious. As strange as it sounds, I’ve never had peanut butter added to fudge. A definite must try! Going to do this one this week! Thanks so much for sharing this recipe with all of us. 🙂 One quick question for you…what size pan did you use? 9×13? 9×9? I’ve used an 8×8 and also a Corningwear oval casserole dish – works great in both! I CAN ‘T WAIT TO MAKE THIS FUDGE. SOUNDS GOOD.I WILL LET YOU KNOW HOW IT GOES.